April has kept me moving constantly, with The New Black opening an additional location in the lobby of Centennial Tower (along with planning for two more locations in the coming months) and the SCAA Event in Seattle testing my ability to adjust to two time shifts in a matter of a couple of weeks. 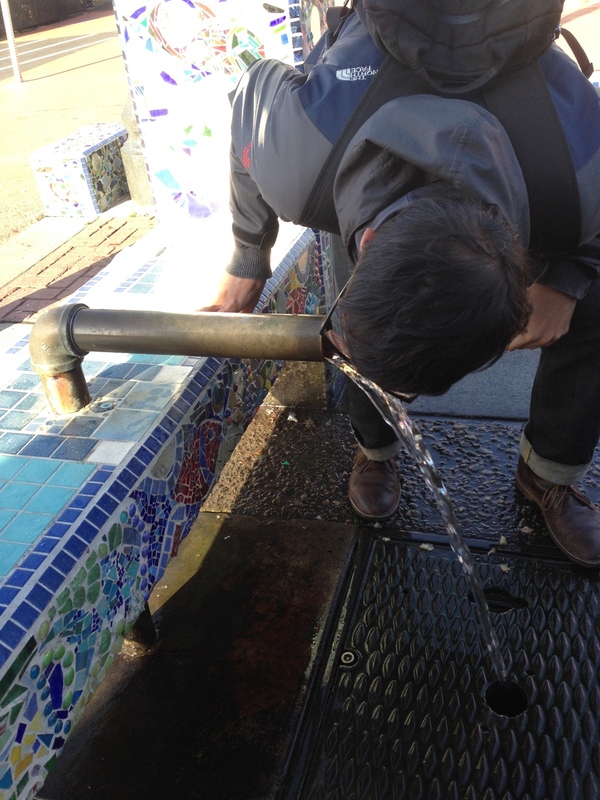 I was able to squeeze in a visit to Olympia, where it was great to catch up with good friends, and to make sure I drank from the locally-famous artesian well in the middle of downtown. I have a superstition that leads me to drink water from this well every time I visit Olympia. I had carried a few samples of my favorite Vietnamese arabica coffees with me for my visit to Olympia Coffee Roasting Company. The response to the coffees was very good, and the crew at OCR were impressed with how much the coffees had improved over the previous harvest. We had finally found some Vietnamese coffees that qualify as specialty! Now for the hard work of improving even more and increasing the volume so that the cost of production comes down to a sustainable level that can compete on the global market. As I've said before, I'm really surprised at how quickly these particular coffees are showing improvement, and I'm excited that the potential is beginning to realize itself. After a few days in Oly, I headed north to Seattle. The SCAA Event is specialty coffee's biggest trade show and conference, with over 12,000 attendees this year. It's also like a big coffee family reunion, giving me a chance to catch up with many old friends while making some new ones, it's really the best snapshot of what's going on in the industry. New technology, new coffees and roasting companies, familiar ones and people looking to connect walk the trade show floor for three days - having hundreds of conversations in the process. It's nearly impossible to simply cross from one end to the other without running into half a dozen people who want to chat, a very welcome diversion. On the first morning, I was a guest barista at Modbar's booth, pulling shots of Olympia Coffee's Sweetheart Espresso, a new project that highlights one coffee roasted with a profile different to their previous espressos that highlights sweetness. This Sweetheart iteration was from Burundi, sourced in collaboration with The Long Miles Coffee Project, which is worth a separate post on its own. The coffee was indeed very sweet, full of sugary dark fruit. At Modbar's booth, many of the people I had hoped to bump into just showed up, which made finding them much easier than picking them out of the giant crowds. I spent many more hours just hanging out and helping the lovely Modbar folks explain their technology to the stream of people who were eager to learn more. It was there that I got a chance to hang out and brew coffee with a coffee hero of mine, George Howell, and his daughter-green coffee buyer, Jenny. They were keen on learning more about the pour over unit, which allows the user to program a brew, essentially automating the process to mimic a hand-poured filter coffee. It's nearly as easy as hitting "record" and "playback," repeating timing, dispensing volume, pulses, delays and temperatures. Pretty dang cool. They were impressed with the machine, and of course the coffee was good. Jenny brought some of their Ethiopia Kochere for brewing, and was packing a VST Refractometer to measure the results. "Can I be your friend?" was what I wanted to say, but instead I asked if I could have a photo with them and they obliged my inner coffee fanboy. The Howell family and me with a big stupid smile. I saw so many great people, awesome tech, and of course tasted so many delicious coffees. It would be ridiculous to recount all of the details here. The highlight was seeing Sasa Sestic win the World Barista Championship. I had the pleasure of judging him for the FHA 2014 World Barista Challenge finals, where he placed 5th overall. The Challenge is based on WBC rules and regulations, but is a separate event sanctioned by a different organizing body [FHA]. I remembered his presentation and coffees were so delicious and was honored that I had once been served by a reigning champion. He remembered me and was happy that I was there to witness his crowning moment. His presentation was amazing, presenting new ideas that I'm sure we will see more of in the coming year. Sprudge did a decent summary of his victory, so I need not repeat it here. Still in shock, Sasa is still his ol' friendly self. So proud of him. The day after the show, I boarded a plane headed for Singapore to begin training a new batch of The New Black baristas in preparation for our next outlet openings. I've been able to catch up with many of my coffee friends in Singapore, and it's good to see that everyone is making progress in their respective roles. Coffees are improving everywhere, and that's good news for everyone.